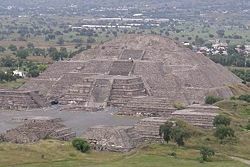 The Pyramid of the Moon in Tenochtitlán, Mexico. Building projects of this size require the social organization found in civilizations. Civilization refers to a complex human society, in which people live in groups of settled dwellings comprising cities. Early civilizations developed in many parts of the world, primarily where there was adequate water available. 1.1 Problems with the term "civilization"
The causes of the growth and decline of civilizations, and their expansion to a potential world society, are complex. However, civilizations require not only external advances to prosper, but also the maintenance and development of good social and ethical relationships usually grounded in religious and spiritual norms. The term "civilization" or "civilisation" comes from the Latin word civis, meaning "citizen" or "townsman." By the most minimal, literal definition, a "civilization" is a complex society. Anthropologists distinguish civilizations in which many of the people live in cities (and obtain their food from agriculture), from tribal societies, in which people live in small settlements or nomadic groups (and subsist by foraging, hunting, or working small horticultural gardens). When used in this sense, civilization is an exclusive term, applied to some human groups and not others. "Civilization" can also mean a standard of behavior, similar to etiquette. Here, "civilized" behavior is contrasted with crude or "barbaric" behavior. In this sense, civilization implies sophistication and refinement. Another use of the term "civilization" combines the meanings of complexity and sophistication, implying that a complex, sophisticated society is naturally superior to less complex, less sophisticated societies. This point of view has been used to justify racism and imperialism—powerful societies have often believed it was their right to "civilize," or culturally dominate, weaker ones ("barbarians"). This act of civilizing weaker peoples has been called the "White Man's Burden." In a broader sense, "civilization" often refers to any distinct society, whether complex and city-dwelling, or simple and tribal. This usage is less exclusive and ethnocentric than the previous definitions, and is almost synonymous with culture. Thus, the term "civilization" can also describe the culture of a complex society, not just the society itself. Every society, civilization or not, has a specific set of ideas and customs, and a certain set of items and arts, that make it unique. Civilizations have more intricate cultures, including literature, professional art, architecture, organized religion, and complex customs associated with the elite. Samuel P. Huntington, in his essay The Clash of Civilizations, defined civilization as "the highest cultural grouping of people and the broadest level of cultural identity people have short of that which distinguishes humans from other species." In this sense, a Christian woman of African-American descent, living in the United States of America, would be, above all, considered a member of "Western civilization," even though she identifies with many cultures. Finally, "civilization" can refer to human society as a whole, as in the sentence "A nuclear war would wipe out civilization," or "I'm glad to be safely back in civilization after being lost in the wilderness for three weeks." It is also used in this sense to refer to a potential global civilization. 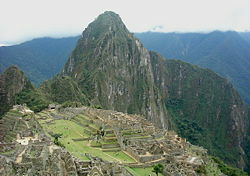 Problems with the term "civilization"
As discussed above, "civilization" has a variety of meanings, and its use can lead to confusion and misunderstanding. Moreover, the term carried a number of value-laden connotations. It might bring to mind qualities such as superiority, humaneness, and refinement. Indeed, many members of civilized societies have seen themselves as superior to the "barbarians" outside their civilization. Many postmodernists, and a considerable proportion of the wider public, argue that the division of societies into "civilized" and "uncivilized" is arbitrary and meaningless. On a fundamental level, they say there is no difference between civilizations and tribal societies, and that each simply does what it can with the resources it has. In this view, the concept of "civilization" has merely been the justification for colonialism, imperialism, genocide, and coercive acculturation. For these reasons, many scholars today avoid using the term "civilization" as a stand-alone term, preferring to use the terms urban society or intensive agricultural society, which are less ambiguous, and more neutral. "Civilization," however, remains in common academic use when describing specific societies, such as the Maya Civilization. As noted above, the term "civilization" has been used almost synonymously with culture. This is because civilization and culture are different aspects of a single entity. Civilization can be viewed as the external manifestation, and culture as the internal character of a society. Thus, civilization is expressed in physical attributes, such as toolmaking, agriculture, buildings, technology, urban planning, social structure, social institutions, and so forth. Culture, on the other hand, refers to the social standards and norms of behavior, the traditions, values, ethics, morality, and religious beliefs and practices that are held in common by members of the society. An Egyptian farmer using a plow drawn by domesticated animals, two developments in agriculture that started the Neolithic Revolution and led to the first civilizations. Toolmaking, which permits the development of intensive agricultural techniques, such as the use of human power, crop rotation, and irrigation. This has enabled farmers to produce a surplus of food beyond what is necessary for their own subsistence. A significant portion of the population that does not devote most of its time to producing food. This permits a division of labor. Those who do not occupy their time in producing food may obtain it through trade, as in modern capitalism, or may have the food provided to them by the state, as in Ancient_Egypt. This is possible because of the food surplus described above. Some form of ruling system or government. This can be a chiefdom, in which the chieftain of one noble family or clan rules the people; or a state society in which the ruling class is supported by a government or bureaucracy. A social hierarchy consisting of different social classes. A form of writing will have developed, so that communication between groups and generations is possible. A concept of a Higher being, though not necessarily through organized religion, by which a people may develop a common worldview that explains events and finds purpose. A concept of time, by which the society links itself to the past and looks forward to the future. A concept of leisure, permitting advanced development of the arts. Development of a faculty for criticism. This need not be the rationalism of the West, or any specific religious or political mechanism, but its existence is necessary for enabling the society to contemplate change from within rather than suffering attack and destruction from outside. Based on these criteria, some societies, like that of Ancient Greece, are clearly civilizations, whereas others, like the Bushmen, are not. However, the distinction is not always so clear. In the Pacific Northwest of the United States, for example, an abundant supply of fish guaranteed that the people had a surplus of food without any agriculture. The people established permanent settlements, a social hierarchy, material wealth, and advanced art (most famously totem poles), all without the development of intensive agriculture. Meanwhile, the Pueblo culture of southwestern North America developed advanced agriculture, irrigation, and permanent, communal settlements such as Taos Pueblo. However, the Pueblo never developed any of the complex institutions associated with civilizations. Today, many tribal societies live in states and according to their laws. The political structures of civilization were superimposed on their way of life, and so they occupy a middle ground between tribal and civilized. Early human settlements were built mostly in river valleys where the land was fertile and suitable for agriculture. Easy access to a river or a sea was important, not only for food (fishing) or irrigation, but also for transportation and trade. Some of the earliest known civilizations arose in the Nile valley of Ancient Egypt, on the island of Crete in the Aegean Sea, around the Euphrates and Tigris rivers of Mesopotamia, the Indus Valley region of modern Pakistan, and in the Huang He valley (Yellow River) of China. The inhabitants of these areas built cities, created writing systems, learned to make pottery and use metals, domesticated animals, and created complex social structures with class systems. Both anthropological and archaeological evidence indicate the existence of a grain-grinding and farming culture along the Nile in the tenth millennium B.C.E. Evidence also indicates human habitation in the southwestern corner of Egypt, near the Sudan border, before 8000 B.C.E. Climate changes and/or overgrazing around 8000 B.C.E. began to desiccate the pastoral lands of Ancient Egypt, eventually forming the Sahara (around 2500 B.C.E.). Early tribes naturally migrated to the Nile River where they developed a settled agricultural economy, and a more centralized society. Domesticated animals had already been imported from Asia between 7500 B.C.E. and 4000 B.C.E. There is evidence of pastoralism and cultivation of cereals in the East Sahara in the seventh millennium B.C.E. The earliest known artwork of ships in Ancient Egypt dates to 6000 B.C.E. By 6000 B.C.E. Pre-dynastic Egypt (in the southwestern corner of Egypt) was herding cattle and constructing large buildings. Symbols on Gerzean pottery (around 4000 B.C.E.) resemble traditional Egyptian hieroglyph writing. In Ancient Egypt mortar (masonry) was in use by 4000 B.C.E., and ancient Egyptians were producing ceramic faience as early as 3500 B.C.E. There is evidence that ancient Egyptian explorers may have originally cleared and protected some branches of the 'Silk Road.' Medical institutions are known to have been established in Egypt since as early as around 3000 B.C.E. 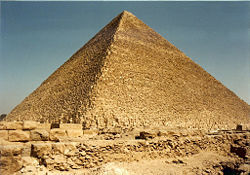 Ancient Egypt also gains credit for the tallest ancient pyramids, and the use of barges for transportation. Egyptian religion permeated every aspect of life. It dominated life to such an extent that almost all the monuments and buildings that have survived are religious rather secular. The dominant concern of Egyptian religion was maintenance of the rhythm of life, symbolized by the Nile, and with preventing order from degenerating into chaos. Egyptians believed profoundly in an after-life, and much effort and wealth was invested in building funerary monuments and tombs for the rulers. The priests served the Gods but also performed social functions, including teaching, conducting religious rites and offering advice. Arnold J. Toynbee claimed that of the 26 civilizations he identified, Egypt was unique in having no precursor or successor, although since Egypt bequeathed many ideas and concepts to the world it could be argued that human kind as a whole is the successor. Ancient Egyptian contributions to knowledge in the areas of mathematics, medicine, and astronomy continue to inform modern thought. While Egyptian religion no longer exists in its original form, both Judaism and Christianity acknowledge a certain indebtedness to Egypt. Aegean civilization is the general term for the prehistoric civilizations in Greece and the Aegean. The earliest inhabitants of Knossos, the center of Minoan Civilization on Crete, date back to the seventh millennium B.C.E. The Minoans flourished from approximately 2600 to 1450 B.C.E., when their culture was superseded by the Mycenaean culture, which drew upon the Minoans. 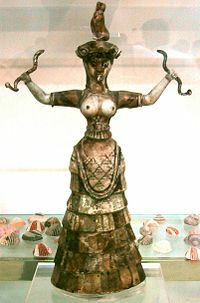 Based on depictions in Minoan art, Minoan culture is often characterized as a matrilineal society centered on goddess worship. Although there are also some indications of male gods, depictions of Minoan goddesses vastly outnumber depictions of anything that could be considered a Minoan god. There seem to be several goddesses including a Mother Goddess of fertility, a "Mistress of the Animals," a protectress of cities, the household, the harvest, and the underworld, and more. They are often represented by serpents, birds, and a shape of an animal on the head. Though the notorious bull-headed Minotaur is a purely Greek depiction, seals and seal-impressions reveal bird-headed or masked deities. Minoan sacred symbols include the bull and its horns of consecration, the "labrys" (double-headed axe), the pillar, the serpent, the sun, and the tree. An indigenous writing system, which consisted of characters of which only a very small percentage were identical, or even obviously connected, with those of any other script. Aegean Art is distinguishable from those of other early periods and areas. While borrowing from other contemporary arts Aegean craftsman gave their works a new character, namely realism. The fresco-paintings, ceramic motifs, reliefs, free sculpture, and toreutic handiwork of Crete provide the clearest examples. Aegean Architecture: Aegean palaces are of two main types. First (and perhaps earliest in time), the chambers are grouped around a central court, being linked to one another in a labyrinthine complexity, and the greater oblongs are entered from a long side and are divided longitudinally by pillars. Second, the main chamber is of what is known as the megaron type, i.e. it stands free, isolated from the rest of the plan by corridors, is entered from a vestibule on a short side, and has a central hearth, surrounded by pillars and perhaps open to the sky. There is no central court, and other apartments form distinct blocks. In spite of many comparisons made with Egyptian, Babylonian and Hittite plans, both of these arrangements remain out of keeping with any remains of earlier or contemporary structures elsewhere. 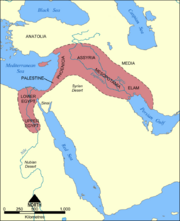 The Fertile Crescent is a historical region in the Middle East incorporating Ancient Egypt, the Levant, and Mesopotamia. Watered by the Nile, Jordan, Euphrates, and Tigris rivers and covering some 400-500,000 square kilometers, the region extends from the eastern shore of the Mediterranean Sea, around the north of the Syrian Desert, and through the Jazirah and Mesopotamia, to the Persian Gulf. The Fertile Crescent has an impressive record of past human activity. As well as possessing many sites which contain the skeletal and cultural remains of both pre-modern and early modern humans (e.g. at Kebara Cave in Israel), later Pleistocene hunter-gatherers and Epipalaeolithic semi-sedentary hunter-gatherers (the Natufians), this area is most famous for its sites related to the origins of agriculture. The western zone around the Jordan and upper Euphrates rivers gave rise to the first known Neolithic farming settlements, which date to around 9,000 B.C.E. (and includes sites such as Jericho). This region, alongside Mesopotamia, which lies to the east of the Fertile Crescent, between the rivers Tigris and Euphrates, also saw the emergence of early complex societies during the succeeding Bronze Age. There is also early evidence from this region for writing, and the formation of state-level societies. This has earned the region the nickname "The Cradle of Civilization." As crucial as rivers were to the rise of civilization in the Fertile Crescent, they were not the only factor in the area's precocity. The Fertile Crescent had a climate which encouraged the evolution of many annual plants, which produce more edible seeds than perennials, and the region's dramatic variety of elevation gave rise to many species of edible plants for early experiments in cultivation. Most importantly, the Fertile Crescent possessed the wild progenitors of the eight Neolithic founder crops important in early agriculture (i.e. wild progenitors to emmer, einkorn, barley, flax, chick pea, pea, lentil, bitter vetch), and four of the five most important species of domesticated animals— cows, goats, sheep, and pigs—and the fifth species, the horse, lived nearby. The religious writings of the Sumerian people, generally regarded as the first people living in Mesopotamia, are the oldest examples of recorded religion in existence. They practiced a polytheistic religion, with anthropomorphic gods or goddesses representing forces or presences in the world, much as in later Greek mythology. Many stories in the Sumerian religion appear homologous to those in other religions. For example, the Judeo-Christian account of the creation of man and Noah's flood narrative closely resemble earlier Sumerian descriptions. The earliest known farming cultures in south Asia emerged in the hills of Balochistan, Pakistan, in the seventh millennium B.C.E. These semi-nomadic peoples domesticated wheat, barley, sheep, goat, and cattle. Pottery was in use by the sixth millennium B.C.E. Their settlements consisted of mud buildings that housed four internal subdivisions. Burials included elaborate goods such as baskets, tools made of stone, bone, beads, bangles, pendants, and occasionally animal sacrifices. Figurines and ornaments of seashells, limestone, turquoise, lapis lazuli, sandstones, and polished copper have also been found in the area. By the fourth millennium B.C.E., there is evidence of manufacturing, including stone and copper drills, updraft kilns, large pit kilns, copper melting crucibles, and button seal devices with geometric designs. Villagers domesticated numerous crops, including peas, sesame seed, and cotton, plus a wide range of domestic animals, including the water buffalo, which still remains essential to intensive agricultural production throughout Asia today. There is also evidence of shipbuilding craft. Archaeologists have discovered a massive dredged canal and docking facility at the coastal city of Lothal, India, perhaps the world's oldest sea-faring harbor. Judging from the dispersal of artifacts, their trade networks integrated portions of Afghanistan, the Persian (Iran) coast, northern and central India, Mesopotamia, and Ancient Egypt. Archaeologists studying the remains of two men from Mehrgarh, Pakistan, discovered that the people of the Indus Valley had knowledge of medicine and dentistry as early as circa 3300 B.C.E. The Indus Valley Civilization is credited with the earliest known use of decimal fractions in a uniform system of ancient weights and measures, as well as negative numbers. Ancient Indus Valley artifacts include beautiful, glazed stone faïence beads. The Indus Valley Civilization boasts the earliest known accounts of urban planning. As seen in Harappa, Mohenjo-daro and recently discovered Rakhigarhi, their urban planning included the world's first urban sanitation systems. Evidence suggests efficient municipal governments. Streets were laid out in perfect grid patterns comparable to modern New York City. Houses were protected from noise, odors, and thieves. The sewage and drainage systems developed and used in cities throughout the Indus Valley were far more advanced than that of contemporary urban cities in the Middle East. This civilization represents an early flowering of culture and of organized city life from which Indian people would later draw. Hinduism can be regarded as having some of its roots in the religious life and practices of this civilization. Findings of figurines depicting female fertility indicate that the Indus Valley people worshipped a Mother goddess. Seals depicting animals, perhaps as the object of veneration, have also been discovered that are comparable to the zoomorphic aspects of some Hindu gods. China is one of the world's oldest continuous major civilizations, with written records dating back 3,500 years. China was inhabited, possibly more than a million years ago, by Homo erectus. Perhaps the most famous specimen of Homo erectus found in China is the so-called Peking Man (北京人) found in 1923. The Homo sapiens or modern human might have reached China about 65,000 years ago from Africa. Early evidence for proto-Chinese rice paddy agriculture is carbon-dated to about 6000 B.C.E., and associated with the Peiligang culture (裴李崗文化) of Xinzheng county (新鄭縣), Henan (河南省). With agriculture came increased population, the ability to store and redistribute crops, and to support specialist craftsmen and administrators. In late Neolithic times, the Huang He (黃河) valley began to establish itself as a cultural center, where the first villages were founded; the most archaeologically significant of those was found at Banpo (半坡), Xi'an (西安). Turtle shells with markings reminiscent of ancient Chinese writing from the Shang Dynasty (商朝) have been carbon dated to around 1500 B.C.E. These records suggest that the origins of Chinese civilization started with city-states that may go back more than 5,000 years. Some basic religious concepts of early Chinese civilization continued to be held by most Chinese even after the advent of Buddhism and Taoism. Heaven was seen as an omnipotent entity, endowed with personality but no corporeal form. The emperor was regarded as the "Son of Heaven," and he typically led the imperial court in performing elaborate annual religious rituals. He was not believed to be a deity, but rather someone who mediated between the forces of heaven and earth. The emperor was believed to carry the "Mandate of Heaven." The concept of the modern world as distinct from an ancient world of historical and outmoded artifacts rests on a sense that the modern world is primarily the product of relatively recent and revolutionary change. Advances in all areas of human activity —politics, industry, economics, commerce, transport, communication, science, medicine, technology, and culture—appear to have transformed an "Old World" into the "Modern or New World." In European politics, the transition from feudal institutions to modern states has been marked by a series of revolutions. The English Glorious Revolution of 1688 marked the end of feudalism in Great Britain, creating a modern constitutional monarchy. The American and French Revolutions ended the powers of absolute monarchs. Leaders such as Napoleon introduced new codes of law in Europe based on merit and achievement, rather than on a social class system rooted in feudalism. The power of elected bodies supplanted traditional rule by royal decree. The new republic of the United States of America attempted to place reins on government based on the new Constitution, creating a system of checks and balances between the three different branches of government, the legislature, judiciary, and executive headed by a President who was chosen via a national election. Revolutions in science and technology have been no less influential than political revolutions in changing the shape of the modern world. The "scientific revolution," beginning with the discoveries of Johannes Kepler and Galileo, and culminating with Isaac Newton's Philosophiae Naturalis Principia Mathematica (1687), changed the way in which educated people looked at the natural world. Twentieth-century advances in physics revolutionized our understanding of the universe. New theories such as evolution and psychoanalysis changed humanity's views of itself. However, not all scientific advances have been positive. Warfare was changed with the advent of new varieties of weapons. Weapons of mass destruction, such as the atomic bomb, along with chemical weapons and biological weapons, have actually made possible the devastation of the entire planet Earth. Mechanical and scientific inventions changed the way in which goods were produced and marketed. The telephone, radio, X rays, microscopes, and electricity all contributed to rapid changes in life-styles. The newly invented engine powered the car, train, ship, and eventually the airplane, revolutionizing the way people traveled. Discoveries of antibiotics such as penicillin brought new ways of combating diseases. Surgery and medications made progressive improvements in medical care, hospitals, and nursing. The Industrial Revolution that commenced in eighteenth-century Great Britain transformed the world. Machines sped up the manufacture of commodities such as cloth and iron. The horse and ox were no longer needed as beasts of burden. Artificially-created energy powered any motor that drove any machine that was invented. Raw goods could be transported in huge quantities over vast distances; products could be manufactured quickly and then marketed all over the world. New attitudes towards religion, with the decline of traditional churches, and a desire for personal freedoms, induced desires for sexual freedoms, which were ultimately accepted by large sectors of the Western World. Equality of the sexes in politics and economics, the women's liberation movement, and the freedom afforded by contraception greatly changed the role of women in all aspects of society. Modern art is typified by self-awareness, and by the manipulation of form or medium as an integral part of the work itself. Whereas pre-modern Western art merely sought to represent a form of reality, modern art tends to encourage the audience to question its perceptions, and thereby, the fundamental nature of art itself. Key movements in modern art include cubist painting, typified by Pablo Picasso, modernist literature such as that written by James Joyce, Virginia Woolf and Gertrude Stein, and the "new poetry" headed by Ezra Pound and T. S. Eliot. The nature of civilization is that it seeks to spread, and to expand, and it has the means by which to do so. Civilization has been spread by introducing agriculture, writing systems, and religion to uncivilized tribes. The uncivilized people then adapt to civilized behavior. Civilization has also been spread by force, often using religion to justify its actions. Nevertheless, some tribes or peoples still remained uncivilized. Known as primitive cultures, they do not have hierarchical governments, organized religion, writing systems or controlled economic exchange. The little hierarchy that exists, for example respect for the elderly, is by mutual agreement not enforced by any ruling authority. Historically, civilizations have experienced cycles of birth, life, decline and death, similar to the life cycle of all living things, including human beings. The old is often supplanted by a new civilization with a potent new culture, or character, based on a different worldview bringing different answers to questions of ultimate concern. While this observation is generally not disputed, a variety of reasons for the growth and decline of civilizations have been proposed. Many nineteenth-century anthropologists backed a theory called cultural evolution. They believed that people naturally progressed from a simple to a superior, civilized state. John Wesley Powell, for example, classified all societies as "Savage," "Barbarian," and "Civilized"—the first two of which would shock most anthropologists today. Today, most social scientists believe, at least to some extent, in cultural relativism: the view that complex societies are not by nature superior, more humane, or more sophisticated than less complex or technologically advanced groups. This view has its roots in the early twentieth-century writings of Franz Boas. Boas claimed that development of any particular civilization cannot be understood without understanding the whole history of that civilization. Thus each civilization has its own unique birth, peak, and decline, and cannot be compared to any other civilization. English biologist John Baker, in his 1974 book Race, challenged this view. His highly controversial work explored the nature of civilizations, presenting 23 criteria that characterize civilizations as superior to non-civilizations. He tried to show a relationship between cultures and the biological disposition of their creators, claiming that some races were just biologically and evolutionarily predisposed for greater cultural development. In this way, some races were more creative than others, while others were more adaptive to new ideas. Mid twentieth-century historian Arnold J. Toynbee explored civilizational processes in his multi-volume A Study of History, which traced the rise and, in most cases, the decline of 21 civilizations and five "arrested civilizations." Toynbee viewed the whole of history as the rise and fall of civilizations. "Western Civilization", for example, together with “Orthodox civilization” (Russia and the Balkans) developed after the fall of the Roman Empire, thus succeeding Greco-Roman civilization. According to Toynbee, civilizations develop in response to some set of challenges in the environment, which require creative solutions that ultimately reorient the entire society. Examples of this are the Sumerians' development of irrigation techniques to grow crops in Iraq, or when the Catholic Church included pagan tribes into their religious community. When civilizations utilize new, creative ideas, they overcome challenges and grow. When they are rigid, failing to respond to challenges, they decline. According to Toynbee, most civilizations declined and fell because of moral or religious decline, which led to rigidity and the inability to be creative. Toynbee argued that as civilizations decay, they experience a "schism in the soul," as the creative and spiritual impulse dies. In this environment, a new prophet (such as Abraham, Moses, and Jesus) may experience extraordinary spiritual insight. While these new spiritual insights allow for the birth of a new religion and ultimately a new civilization, they are ultimately impermanent. This is due to their tendency to deteriorate after being institutionalized, as men of God degenerate into successful businessmen or men of politics. It remains to be seen what will come of the four remaining civilizations of the twenty-first century: Western civilization, Islamic society, Hindu society, and the Far East. Toynbee offered two possibilities: they might all merge with Western civilization, or Western civilization might decay and die. An alternative might be the emergence of a new prophet, with the spiritual insight that could bring about a new, unified, world civilization, balancing the strengths of each of the four civilizations. Thus, there are many factors to be considered in understanding the course of any civilization. These include both social, or internal, factors, such as the disposition of the people and the structure of the society, and environmental, or external, factors, such as the availability of water for agriculture and transportation. Whether a civilization declines or continues to develop also depends on both internal and external factors, as they determine the response to the various challenges that the civilization encounters. Members of civilizations have sometimes shunned them, believing that civilization restricts people from living in their natural state. Religious ascetics have often attempted to curb the influence of civilization over their lives in order to concentrate on spiritual matters. Monasticism represents an effort by these ascetics to create a life somewhat apart from their mainstream civilizations. Environmentalists also criticize civilizations for their exploitation of the environment. Through intensive agriculture and urban growth, civilizations tend to destroy natural settings and habitats. Proponents of this view believe that traditional societies live in greater harmony with nature than "civilized" societies. The "sustainable living" movement is a push from some members of civilization to regain that harmony with nature. Marxists have claimed, "that the beginning of civilization was the beginning of oppression." They argue that as food production and material possessions increased, wealth became concentrated in the hands of the powerful, and the communal way of life among tribal people gave way to aristocracy and hierarchy. "Primitivism" is a modern philosophy opposed to civilization for all of the above reasons, accusing civilizations of restricting humans, oppressing the weak, and damaging the environment. The Kardashev scale, proposed by Russian astronomer Nikolai Kardashev, classifies civilizations based on their level of technological advancement, specifically measured by the amount of energy a civilization is able to harness. The Kardashev scale makes provisions for civilizations far more technologically advanced than any currently known to exist. Currently, world civilization is in a stage that may be characterized as an "industrial society," superseding the previous "agrarian society." Some believe that the world is undergoing another transformation, in which civilizations are entering the stage of the "informational society." Political scientist Samuel P. Huntington has argued that the defining characteristic of the twenty-first century will be a "clash of civilizations." According to Huntington, conflicts between civilizations will supplant the conflicts between nation-states and ideologies that characterized the nineteenth and twentieth centuries. Many theorists argue that the entire world has already become integrated into a single "world system," a process known as globalization. Different civilizations and societies all over the globe are economically, politically, and even culturally interdependent in many ways. According to David Wilkinson, civilizations can be culturally heterogeneous, like "Western Civilization," or relatively homogeneous, like the Japanese civilization. What Huntington calls the "clash of civilizations" might be characterized by Wilkinson as a clash of cultural spheres within a single global civilization. In the future, civilizations may be expected to increase in extent, leading to a single world civilization, as well as to advance technologically. However, technological and other external improvements may not be the most important aspect of future civilizations—growth on the internal level (psychological, social, even spiritual) is also needed for any civilization to avoid stagnation and decline. Ultimately, the future of civilizations may depend on the answer to whether history progresses as a series of random events, or whether it has design and purpose, known by religious people as divine providence. Huntington, S. 1993. "The Clash of Civilizations?" Foreign Affairs. 72 (3) (Summer 1993): 22-28. Wilkinson, D. 1987. “Central Civilization.” Comparative Civilizations Review 4: 31-59. Wilkinson, D. 1999. “Unipolarity without Hegemony.” International Studies Review 1 (2): 141-172. This page was last modified on 23 February 2017, at 17:28.